Are You Tired of the Owls Yet? It looks like the one owl baby has learned to fly and "fledged". Isn't that a great word? The youngster leaves the nest each evening. We have actually seen it fly down from the tower. Then it is back home by the time we can see the nest in the morning. I have no idea if this is the usual way owl parents manage their families, but it certainly is the way this family has worked it out. No sign of the parents all week. We rode our bikes around the end of the bay and could go right up to the communications tower but not inside the enclosure. This was fine for these photos, but if I can get inside the fence I can look for owl pellets. We used purchased owl pellets in science. The students could pick apart the dry pellet, locate the bones of owl prey and put the skeleton back together to identify what the owl was eating. It is regurgitated and is dry fur with the bones encased inside. Not a yucky as it sounds. One young student of mine remarked, "It is like a museum inside!" There must be a fortune's worth of pellets under that tower. 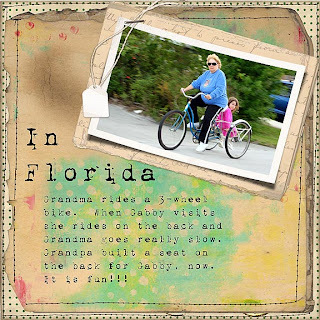 I am not at all sure I would ride a trike like this in Michigan, but I am right in style in Florida on one. My particular trike is actually a conversion kit attached to a regular Schwinn bike. If I can ever locate the kit I may get one for a bike I have in my garage back home. My Granddaughter asked if she could ride on it with me and figured this out for herself. However since, Grandpa has made a seat to fit on the back for her. We can't wait to go for another ride. All of the elements on the scrapbook page are by Kathryn Balint of KB and Friends. You can find them at www.kbandfriends.com . My family is here from Michigan. They flew in on Thursday and Friday before Easter leaving snow and more storms behind. 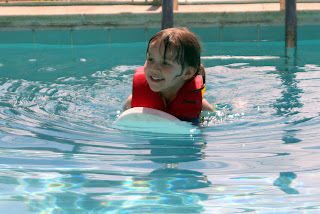 Although I still find the pool water "bracing" the visitors thought it was just fine. The little girls and their big daddy were swimming, jumping, and diving on Saturday and Easter Sunday. Being able to warm up in a hot tub helped, but still. Wednesday there is more snow predicted for Michigan. Poor Daddy who had to go home on Monday. All Mommy wants to do is get a tan! Although Tuesday here is cold for Florida, it will warm up by afternoon and, guess what...NO SNOW! Our town is small and private, but the day before Easter every year there is an egg scramble for the youngsters. It has become more and more well known until this year I think the youngsters and their adult companions outnumbered the total population of the town on a regular day. 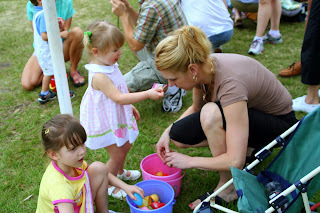 There were over 7,000 plastic eggs filled by volunteers and scattered in 5 or 6 large circles for different age groups. Usually each age group has their own scramble time, but with rain threatening this year, all groups scrambled at once. What chaos but what fun! 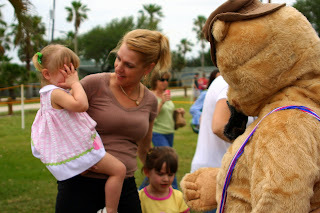 They had music for kiddie dancing, several large characters, and prizes. My 4+ year old granddaughter has gone to this scramble for 4 years, now. What a tradition for her to remember. This evening (March 24, 2008) the owls were very evident up in the nest. There is still the problem of the sun setting behind the tower, but tomorrow sunset I will try to bike over to the other side of the tower and look for a good photo angle with the sun behind me. bigger and stronger. Any day, now, we may see that baby leave with the mother. What a sight that would be. We now have quite a group watching the owl family...neighbors and spring guests. This morning I saw a canoe with 2 men making their way around the shore of the lake. I knew immediately they were the turtle catchers from last year. Ok...I know someone has to catch the turtles for the turtle soup I occasionally eat in an area restaurant. And I know we have a LOT of turtles in this lake, but last year they left their lines out and left several turtles to die. Another resident had to go out in a boat, after the turtle catchers didn't return, and cut the turtles loose. I have a problem with these guys! I called to them and whistled, but they ignored me, although I knew they had seen me. So I searched the phone book for Wildlife and Fisheries. The lady there gave me the phone number for the STATE office that handles licensing. They directed me to the website and number for reporting offenses. That number didn't connect and I was back at square-one. So I called the local police non-emergency number. The lady there called a local official (of what?) who talked to me for a bit and said he would send one of his guys...but he didn't know where our lake was located. Finally a woman called from the local enforcement office. Once she located the lake she told me that, first of all, it is officially designated as a "Retention Pond" and second, hunting of freshwater turtles is permitted. She also said that cutting the hunters' lines is destruction of property, even to save a turtle. There is no time limit on when, or even IF, they have to retrieve their lines. I am sitting here looking at a brochure from the wildlife festival last Saturday that says, One Person CAN Make a Difference" and I am wondering HOW??? Almost every evening we go to this bench at the edge of the lake, just a few yards from the house and watch. We usually have something to drink, the camera, and a pair of binoculars. This year we keep watch of the owl nest because evening things start happening. The parent leaves the nest, going to the edge of the tower. Then she goes a little farther away to another part of the tower. Then finally she drops into the air in the most beautiful flight. She never has to even flap her wings from that height. Yesterday evening we heard a soft low hooting from the island. There was the smaller of the two owls, the one with the lower voice...the male in plain sight. One of our neighbors was out and joined us in watching the owl until he took leave of the perch and flew away. Around that same time we noticed the larger owl leave the nest and finally leave the tower for a night of hunting. Also, for the first time, we could hear the babies squeaking after her. Besides watching the nest, we are constantly watching the water. Large and small turtle heads appear in the evening...looking at us and disappearing again. This time one was different. With the binoculars it was easy to see that a small alligator was giving us the eye. We could see the tail when he submerged again and figured him to be about 2 feet long. One of the friends from Cocoa Beach said he had read that the DNR took an 11 foot alligator out of the lake last summer. Well, no wonder we haven't seen the Big Guy from last year! At least we know there are still little ones around. They are fascinating creatures. Maybe spending an hour at sunset watching owls, alligators, and other creatures sounds boring, but especially with the company of a good neighbor, a couple of drinks, and nice warm breezes, I can't think of much better! I just noticed this brand new marker along a route we drive almost daily. So, today I treated myself to a photo shoot on the property since it wasn't posted "no trespassing". An article about the acquisition of the land is HERE. "The property contains the house built for Paul Kroegel's son, Arthur Rodney Kroegel, as well as Paul's photo studio and two workroom/ warehouses filled with the memorabilia of the first warden of the national wildlife refuge system." Rodney was the son of one of the original residents of Sebastian. His father, Paul, fought for the preservation of the beautiful shore birds being slaughtered for their feathers for hats. A statue of Paul, the father, stands overlooking the Pelican Island Wildlife Preserve...the first in the nation signed into existence in 1904 by Teddy Roosevelt. Paul was the first warden of the preserve. Rodney, born in 1903, was a photographer and one of the original graduates of the first school in Sebastian. The house, although burned out, appears to have been lived in within recent years. There are some wonderful old buildings and plants on the grounds. My "Tales of Sebastian" book says that Rodney's daughter, Janice and her family lived on the homestead near her father, so one of the buildings may be her house. In an article written by Rodney, himself, he says that his father helped him build a photography studio so he could develop and print his own photos. I wonder which building that would be. There was so much to photograph and see that I had quite a few photos to choose from for this piece. Talk about an "odd duck"! This guy was on the seawall this morning with two regular brown duck females (Mallards). I am off to figure out what this fellow is. Isn't this Great Horned Owl gorgeous? I took this photo, but it isn't the exact owl nesting in our communications tower. This fellow was at the Pelican Island Wildlife Festival today. All of the wonderful birds on display, including a bald eagle, have been injured and cannot return to the wild. Several eagles have been found dead this year; one still on her nest. You can't imagine how this hurts my heart. I doubt that I will ever get a chance to see "our" owl up this close but it was fascinating to see one of the brothers or sisters. The first booth/table I saw at the festival was this Owl shirt. Of course I HAD to have it! Also of interest was the Florida Master Naturalist Program. Maybe when we arrive next year I can go to the Center and see if I can complete the program within our Snowbird time line. If only I still had the energy of youth. Every year we see one of these ONCE. Each year I get better photos than the year before. This is the REAL distance at which I have to shoot to get a photo of the owl's nest (red arrow). I know the photos I have been posting here aren't as clear as I would like, but given the distance I don't think they are all that bad. If anyone knows how I can get better photos than using 300mm lens on a tripod with a timer or remote shutter release I am open to ideas. Now I ask you...look at these two photos and tell me...is that a baby that appears at the left part of the nest? I am shooting with a Canon Digital Rebel with a 300mm lens on a tripod and with a remote shutter trip, but this nest is so far away this is the best I can do. I am searching for articles on the Internet about how to shoot these photos. I don't know of any way to do better without buying a longer lens. This is the photo I was out there to try and shoot...the adult takes to the sky around 6:30 PM ET every night and it is awesome to watch...just kind of hard to catch. The tripod is out of the question following a bird on the wing. A litte better shot of the Great Horned Owl nesting in the tower. I am still quite frozen when she spreads the wings and takes off hunting in the evening. We have it pegged to 6:30pm as a prime watching time, but with Daylight Savings Time and Spring on the way, we will adjust. So far I have seen no evidence of a second Owl and that brings a lot of questions to mind. Who helps sit the eggs? ARE there any eggs? Who will help care for the babies? Al that I have read says that the owl couple co-parent. Maybe I have just missed the changing of the guard in the night. Why are there always more questions than answers?? ?